Today we propose you an interesting end extremely sweet pairing: Caramelized peaches and Balsamic Vinegar IGP! This is a fresh idea for an original dessert which combines caramelized peaches with “undercooked” cream, and garnish them with Sauvignon granita and original Balsamic Vinegar of Modena. 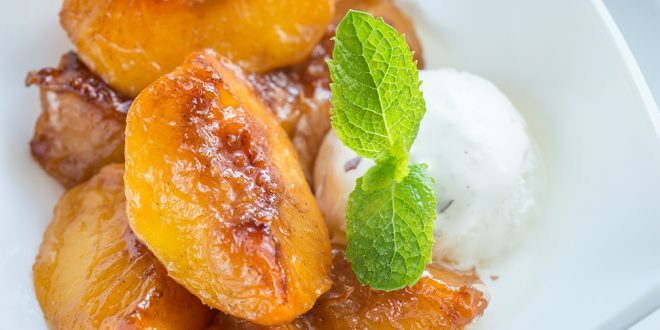 Caramelized peaches and Balsamic Vinegar pair perfectly together and give birth to an extraordinary gourmet dessert that will leave your guests speechless! First of all peel and slice the freestone peaches into thin cubes. 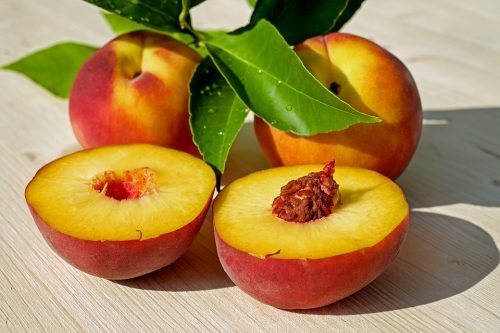 Then put the peach dices in a pan and add the original Balsamic Vinegar; you will use Balsamic Vinegar as a sauce to cook the peaches in order to add them the characteristic balsamic flavor. Cook the peach dices very quickly and then blend them to get a sauce. Subsequently prepare a little of “undercooked” cream: cook the cream, add the sugar and the soaked gelatine (just a little, to obtain a softer cream). Finally leave the cream to cool in the fridge. After that store the peaches cut into slices under vacuum-seal together with a syrup prepared with 100 g of water and 100 g of sugar. Close the vacuum-bag and cook it in water at 70 degrees for about 20 minutes. Now thicken some of the syrup in which the peaches were cooked with a little agar agar. Then you can start to compose the dish with a thickened syrup bottom and the cooked peaches. Finally add in the center a jam prepared with the skins of the peaches and decorate them with the cream; to conclude, add a Sauvignon granita and the reduction of peaches and original Balsamic Vinegar of Modena IGP. Serve this tasty dessert at the end of a special dinner with family and friends: your guests will be delighted! Next A Balsamic Vinegar vocabulary!